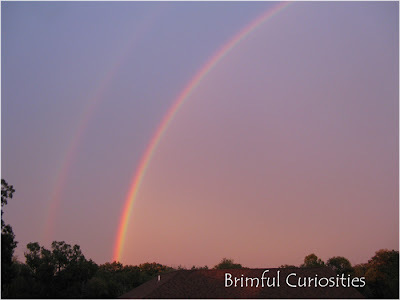 Double rainbow one evening a few weeks ago. A spectacular sight! So cool. I've never seen a double rainbow! This is beautiful! Amazing really! I saw one of those on the way home from work the other day...It made me stop, pause and reflect for a moment on how blessed I am. Your photo just made me do it again. You certainly don't see that very often. Great shot! Wow, what a great capture. I miss rainbows.. I can't recall the last time I saw one. Great shot. oh wow! That is so pretty! I LOVE double rainbows! Your picture turned out beautiful!